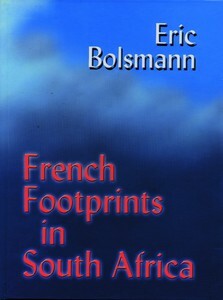 Eric Bolsmann’s book French Footprints in South Africa has been a number of years in the making. It deals with their coming to the Cape of Good Hope, a century and a half before Jan van Riebeeck established his victualling station at Table Bay, and weaves its thread through the southern parts of the African subcontinent, to the present day. The arrival of the Huguenots, in 1688 and 1689, is dealt with and the author sheds new light on the heritage generally attributed to them. Startling revelations concerning French influences in South Africa, can be found in his detailed accounts of the legacy visitors and settlers from France made to Pietermaritzburg, the town the author asserts, has a stronger French heritage and presence than any other town in the country. The almost complete absence of direct influences by the French to the wine industry and the culinary arts comes as a surprise, but this is more than made up for by the enormous cultural and scientific contributions they made to South Africa. The charting of the southern skies by renowned mathematicians and astronomers, and the documents hunters, explorers, writers and naturalists have left us, are related in detail, and so are the efforts of members of the Evangelical Mission Society and the Catholic church, in spreading the word of God and establishing their dioceses. With his staggering attention to detail, French Footprints in South Africa is thus an extremely valuable source of important aspects of our rich and varied heritage. The visual documentation of the personalities covered in the book and the illustrations and colour plates are an additional bonus. French Footprints in South Africa was published by Be My Guest Publishers edition in Pretoria as a 264-page hard-cover, individually numbered limited edition as well as a soft cover in 2008. The hard-cover edition is available at R395,00 incl VAT and postage in the RSA, and the soft cover edition at R250,00 incl postage an VAT in South Africa.